The Bajo Peñas covers a large area and includes all the villages and land around the foot of the Peña Montañesa. As well as being easily accessible by car, it’s also an area which has numerous footpaths and family excursions to enjoy, as well as a few architectural and historical treasures to discover. 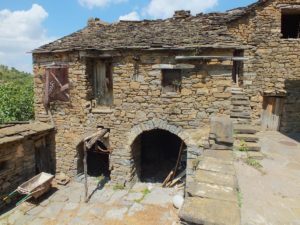 A beautifully tended village which boasts the oldest recorded house in Sobrarbe (Casa Coronas). You’ll also find the church of “La Invención de la Santa Cruz” (14th century) and the chapels of Santa Ana y Santa Engracia. 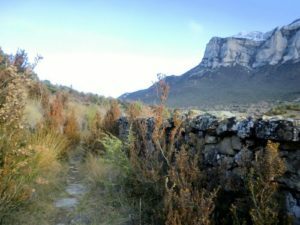 El Pueyo sits on the top of a ridge and has magnificent views up to the Peña Montañesa. 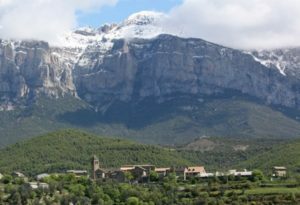 A pleasant village, with impressive views over the Peña Montañesa. The church of San Pedro (17th century) and the grand Casa Betato stand out. In the 7th century, although its original location is unknown, the ancient Visigoth-era Monastery of San Victorián de Asán was destroyed by the Moors and was all but forgotten until the beginning of the 11th century Re-conquest when it was rebuilt in Sobrarbe under the same name. The namesake of the Monastery is San Victorián who, having reached the area from Italy, set himself up as a hermit in a cave within the Peña Montañesa (The hermitage of La Espelunga). Over the centuries the Monastery has accumulated numerous examples of sacred art, notably the main alter piece, the choir seating panel, the silver ark bearing the saint’s remains and a large number of liturgical items. Most of these artistic treasures are now housed in Barbastro’s cathedral and its diocese museum. The Monastery is currently under restoration, which started in 1992. The remaining villages in the municipality of Pueyo de Araguas are Araguás (Casa del Arrendador and the church of la Asunción), San Lorién (church and foundry), Los Molinos, El Plano, Oncins (The chapels of Santa María Magdalena and the Virgen of Pilar), La Muera, El Soto and La Pardina. Laspuña sits on a large fluvial plain used for agriculture on the left banks of the River Cinca. 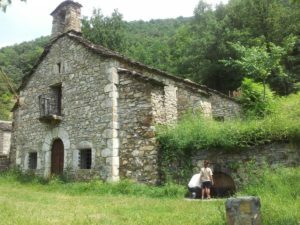 The hamlets of Socastiello y Ceresa, as well as the hermitage of Fuensanta are close by. Laspuña is famous for its Navatas which, every year in May, go down the river Cinca on log rafts from Laspuña/Escalona paying homage to the Navateros who years ago would navigate their crafts all the way down to the Ebro Delta.